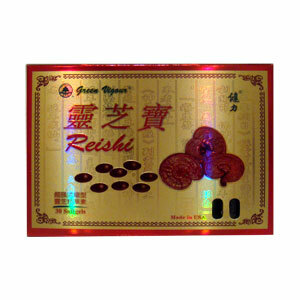 Green Vigor Reishi (Ganoderma Lucidum) is extracted from the best kind of reishi mushroom. Modern technology ensures high purity and concentration of the most potent active ingredients. Green Vigor Reishi (Ganoderma Lucidum) is extracted from the best kind of reishi mushroom. Modern technology ensures high purity and concentration of the most potent active ingredients. Green Vigor Ganoderma Lucidum contains polysaccharides, organic germanium, adenosine, amino acids, protein, etc. It helps balance inner body system and improve circulatory system. It promotes metabolism and strengthens immune system; it helps protect against tissue degeneration, maintains and restores health, and leads to better life quality and longevity. Organic Germanium, amino acids, protein, olive oil and gelatin. As a nutritional supplement, take 1 softgel each time, two times a day.